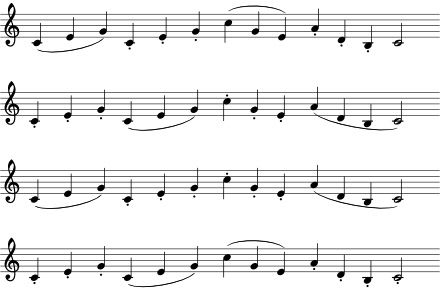 The vocalize can be divided easily into 3 sections of 3 notes and one section of 4, making for many possible variations. So lets get started with something simple. Below are 12 different syllables that can be held during the vocalize. 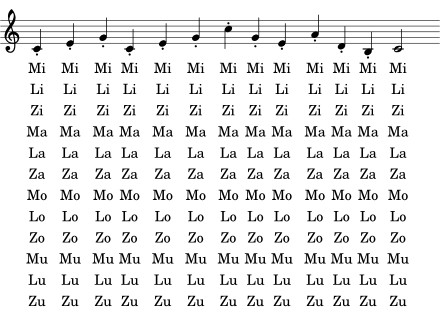 Pure vowels are held and the consonants “M”, “Z”, and “L” are put in front. You could use many other consonants too such as “V” or “H”, so don’t feel limited to the three given. 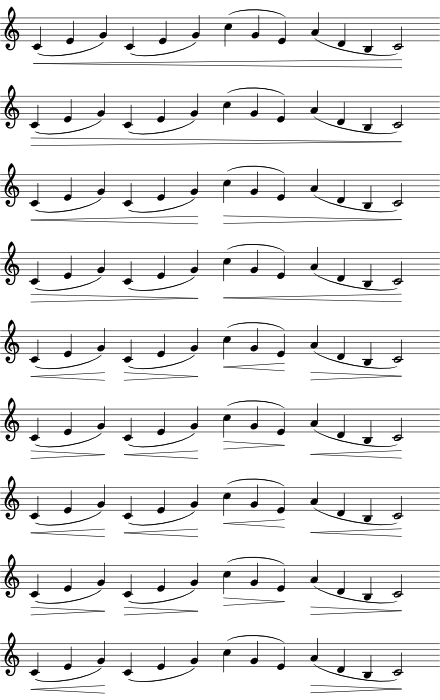 Next we use the same syllables, but this time the syllable is repeated for each note, and each note is staccato (i.e. short). 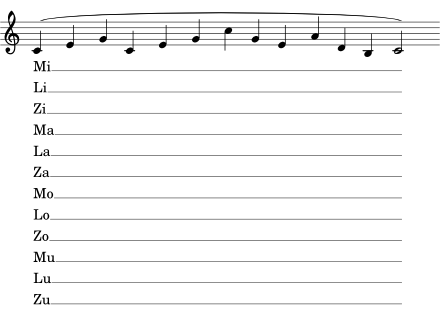 This variation clearly illustrates the sections of the vocalize; each section has a different syllable assigned to it. There’s no reason to change syllable, though. You could have everyone sing “Mi” for each group or whatever any other vowel you want for that matter. This variation shows different ways to combine staccato and legato practice. Use any pattern of syllables you want. Here are many ways to vary the dynamics. Again use whatever syllables you’d like. You can also change some of the legato groups to staccato groups, making a very comprehensive vocalize. And here are several examples of weirder, more fun syllables you can use. As you can see there’s a lot you can do with a vocalize, and really these variations are just the beginning. There are still many more variations for this one vocalize. Hopefully this post has inspired you to come up with your own variations on vocalizes you’ve been doing in the past or other vocalizes on this site. These techniques are fairly universal, meaning the can be applied to most if not all vocalize skeletons you’re given. The goal is to keep your choir conscious during warm-ups, and by using as many variations as you can you can get away with only having a handful of skeletons memorized. There’s no reason your choir should feel bored. Enjoy!